In both the U.S. and European Union, pesticide producers contract with laboratories to perform required safety tests of active ingredients they hope to register for use. 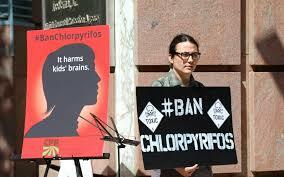 While these studies are generally considered ‘confidential business information’ and not available to the public, using Swedish freedom of information laws, researchers were able to obtain two key studies relating to the developmental neurotoxicity of chlorpyrifos. Although not disclosed within the study, it is well known that multinational chemical company Dow Agroscience is the primary registrant for chlorpyrifos. Scientists first analyzed a study performed in 1997-8, which used laboratory rats exposed to the chemical as a reference for health impacts to prenatal human exposure. Summary reports indicated possible effects to a specific area of the brain known as the cerebellum, which regulates motor control. This led researchers to further investigate the underlying data. The industry-contracted laboratory concluded that at low to medium doses, there were no observed impacts, and, at high doses, impacts were seen but were a result of undernutrition caused by toxicity in the mother rat. These findings led to an overall determination–accepted by regulators–that the chemical does not affect developmental neurotoxicity. However, the independent scientists indicate that this conclusion was backed up by averaging impacts to the brain, rather than looking at the cerebellum, the specific brain region impacted. Although seemingly subtle to readers without considerable scientific background, the study notes that such an approach is considered by EPA to be an “inappropriate and inconclusive manipulation of data.” Despite this clear-cut abuse of data, regulators never requested that the laboratory correct this approach. A re-analysis by scientists finds that in low and medium doses, cerebellum height decreased up to 11%, and up to 14% at the highest dose compared to control rats. This indicates “statistically highly significant” effects the authors note were observed in the absence of toxicity in the mother rat. Although a review of this type was not included in the report submitted to regulators, it strongly supports the conclusion that chlorpyrifos is a developmental neurotoxin. Independent scientists also identified other shortcomings from the same industry-contracted laboratory. Notably, the study length did not adequately match up with the length of time necessary to make a comparison between human and rat development. Further, the lab failed to show developmental impacts from lead nitrate used as a positive control (positive control is a control where you know the response). Unfortunately, studies conducted by a separate lab in 2015 for a structurally similar compound, chlorpyrifos-methyl, also revealed errors. Like the previous study, rats were dosed with chlorpyrifos (this time only at a high level) to observe developmental neurotoxicity. It was revealed that the second lab had missing data for half of its data points related to cerebellum height. And less than half of these missing points were given explanations. The lab concluded that the missing data did not impact the overall interpretation of the study, however scientists re-reviewing this data found this to be a red flag. The independent scientists indicate that the industry-contracted lab may have inadequately modeled exposure relative to human impacts. This suspicion is further backed up by the fact that the lab could not produce data on the actual amount of chlorpyrifos nursing rats were exposed to. This is far from the first time industry-contracted labs have undermined public trust and public health. In the early 1980s, a major scandal unraveled in the 1970s when it was uncovered that a prominent industry-contracted lab called Industrial Biotest was falsifying and covering up inaccurate research data used by EPA to register pesticides. Outrage led to criminal convictions and new regulations, however it is evident many problems still remain. The Monsanto Papers, published in 2017, reveal a long history of industry meddling and collusion with EPA, stretching back to Agent Orange and dioxin contamination. And recently, as part of the discovery process associated with the glyphosate trial, it was revealed that Monsanto worked closely with top-level EPA officials to stop government reviews of its flagship weedkiller Roundup. Chlorpyrifos itself has also been the subject of industry meddling, as reports indicate former EPA administrator Scott Pruitt met privately with the CEO of Dow several weeks before reversing EPA’s tentative decision to ban on the chemical. Require toxicity studies be commissioned by regulatory authorities, not the chemical industry. Select contracted labs based on a history of proficiencies in performing safety tests. Eliminate ‘confidential business information’ and allow independent scientists access to raw data. Eschew the propensity for ‘regrettable substitutions’ that undermine the review system by substituting chemicals like chlorpyrifos for less studied chemical cousins like chlorpyrifos-methyl. Establishing these practices would go a long way towards regaining public trust in the pesticide review process. As it stands, more and more states and communities are rejecting EPA reviews as politically tainted and unable to adequately protect human and environmental health. Help your community obviate EPA’s failed pesticide regulatory scheme by working to pass laws at the local level that focus on safely managing pests. Sign here to tell us you’re ready to fight, and receive a helpful guide on how to create community change. Whether its adopting alternatives for lawns and landscapes, around the home, or in food production, the tools exist to eliminate toxic pesticides. This entry was posted on Tuesday, November 20th, 2018 at 12:00 am	and is filed under Brain Effects, Children, Chlorpyrifos, Environmental Protection Agency (EPA), Nervous System Effects, organophosphate, Uncategorized. You can follow any responses to this entry through the RSS 2.0 feed. You can skip to the end and leave a response. Pinging is currently not allowed.